Starting in January, the common incandescent light bulb becomes illegal, well maybe, in most of the United States. (Some recalcitrant states, SC and TX to name two, seem hell bent on reminding the federal government of the long forgotten 10th Amendment to the U.S. Constitution, but wasn’t that fight settled a long time ago?) Advocates of this law say that it encourages the use of more energy efficient lighting sources such as CFL and LED lights. It has been noted that a large fraction of the energy consumed by an incandescent light bulb goes to create heat and not light, and that the newer, high tech devices produce an equal amount of light using less energy. However, those of us who aren’t lucky enough to live in AZ, south FL, or San Diego, demand a LOT of heat many months of the year. In Montana, I use natural gas to heat my home about 7-8 months of the year. In South Carolina, I heat my home about 5-6 months of the year using wood and electricity, not every day, but most of them from November to April. He makes the point that for many areas of America, the heat energy emitted from incandescent light bulbs is not ‘wasted’ as it serves the function of heating your home. Yet another reason why top-down efficiency standards are not the correct way forward, as different consumers have vastly different uses for these products. If companies are truly capable of producing similar lighting products that use less energy, consumers will switch to these as they will save money on electricity. 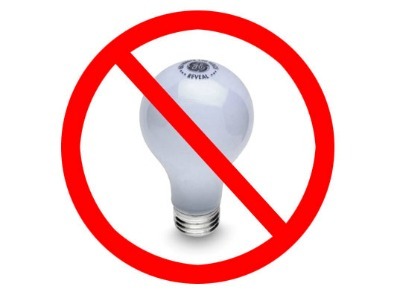 When you hear light bulb manufacturer’s such as General Electric get anxious about the potential to overturn this law, it makes you wonder, are they worried that no one will purchase the new bulbs without the ban on traditional incandescents in place? Read Tim Carney on the left’s odd abuse of language employed attacking those who are against the ban. Read about the Department of Energy’s ad campaign to convince you to support their agenda. The enemy is at it again !!! Will they ever stop violating our Constitution and leave us alone in peace and freedom? I wouldn’t bet on it. If the 10th Amendment is irrelevant, let the States be abolished. Good thing Massachusetts never enforced the provisions of the Federal Fugitive Slave Act. In the meantime, I’ll pass on the $40 LED light bulbs. Too pricey. Next post: Has Chesapeake Energy CEO Aubrey McClendon Turned the Corner on Rent-Seeking?